Lees Summit City Hall is located at 220 Southeast Green Street, Lees Summit, MO 64063; phone: 816-969-1000. Photo: 304 and 306 SE Fifth Street (ca. 1910 and 1900, respectively), (Southeast Grand Avenue and Fifth Street Residential Historic District), Lees Summit, MO. The Historic District was listed on the National Register of Historic Places in 2011. 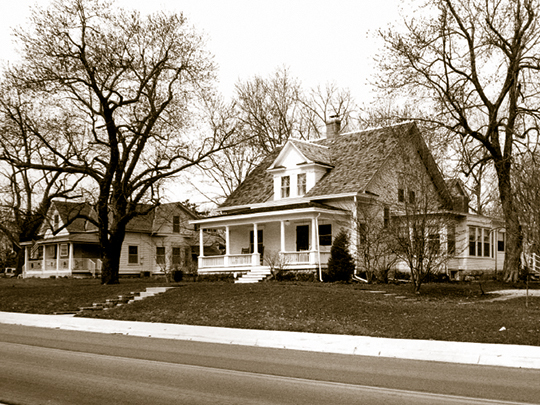 Photograph by Brad Finch, F-Stop photography, 2010, for nomination document, Southeast Grand Avenue and Fifth Street Residential Historic District, Lees Summit, MO NR# 11000216, National Park Service, National Register of Historic Places. Among the early Jackson County residents who returned to their land after the Civil War was William Howard, one of the oldest and most influential citizens of the area. Howard, a native of Kentucky, first came to the area in 1842 and purchased 220 acres of land. In 1844, he married Maria D. Strother. By 1850, they lived in a log house on 833 acres about five miles to the north of Lee's Summit, at what is today the west corner of Highway 291 and Woods Chapel Road. They remained on the farm until October of 1862, when Howard was arrested as a Confederate sympathizer and taken to federal headquarters in Independence. Paroled, he took his family to Kentucky for the duration of the war. After the war, Howard returned and took advantage of the coming of the Missouri Pacific Railroad line into Jackson County and platted the town that became Lee's Summit. Howard's original plat contained 70 acres. The first sale of lots was on October 29, 1865. Howard and the railroad company agreed that the railroad received every alternate lot in four blocks, two on each side of the track, near the center of the town. Its access to the Missouri Pacific Railroad line gave the town direct links to national railroad freight and passenger hubs in St. Louis to the east and Kansas City to the west. The exact date and naming of the community is uncertain. Traditional accounts hold that for its first three years the town was named Strother after Howard's wife's family. By 1868, the town bore the name of Lee's Summit in memory of Dr. Pleasant Lea. The account notes that the hilltop farm of Dr. Pleasant Lea, north of the town site, was the location for much of the surveying for the railroad. To honor Lea, the railroad engineers involved in the survey named the railroad station after him. They erred in the spelling and punctuation, formally noting the station as "Lees Summit." The station's name became popular and the citizens of Strother petitioned the Jackson County Court on November 4, 1868 to change the name to "Lee's Summit" with an apostrophe, but with the same misspelling. Another variation is that when the railroad donated a boxcar to serve as the first railroad station in the new town, "Lee's Summit" was painted on it. This view holds that the railroad chose the name to honor a local doctor, Dr. Pleasant Lea, who had been shot near the tracks during the Civil War. The spelling of his name was not corrected and, therefore, became "Lee." The "summit" came from its topographical location as the highest summit on the line between St. Louis and Kansas City. While originally platted as "Strother," the town name was officially changed to "Lee's Summit" in 1868. This version of the town's naming has recently been questioned by information found on a poster notice advertising the first sale of the town lots on October 30, 1865. Local historian, Donald R. Hale purchased a trunk in 1993 that once belonged to William B. Howard, the town founder. The sale bill was among its contents. Howard's notice advertised the town land sale to be held at "Strother, formerly called Lee's Summit on the Pacific Rail Road in Jackson County, Missouri." Hale believes that it is possible that the town had been known as "Lee's Summit" for some time prior to becoming Strother. Frank Graves, another local historian, agrees. Evidence supporting their argument can be found in a December 1865 St. Louis Democrat newspaper article that refers to a railroad stop in "Lee's Summit." Jackson County railroad historian, Henry Marnett noted that railroads generally named division points along the line where engineers fueled their steam engines with coal or wood and water. He noted that Lee's Summit could very well have been a railroad stop before a town was officially formed. Once the railroad chose a division point and named it, commercial buildings usually sprang up hastily as well. If the railroad pulled a railroad car into town to be used for a railroad station after the town was officially founded and it already had "Lee's Summit" written on it, the railroad may have been using the name for some time. The track from Warrensburg to Kansas City (through Lee's Summit) was finished between 1864 and 1865. Taking all this into consideration, it appears that the station was designated as Lees Summit by the railroad prior to the filing of the official plat name of Strother. The 1868 petition to the county court officially changed the name to Lee's Summit. Historic Preservation Services, LLC for the City of Lee's Summit, Missouri, Historic Preservation Plan, 2002, www.lees-summit-mo-us, accessed July, 2011.